I have wanted to review they synastry of Chris Brown and Rihanna for quite some time, the desire only heightened after Rihannas interview with Oprah and the ever present rumors of their secret rendezvous’ and late night meet ups and well today according to media reports Chris Brown has given the boot to his girlfriend, is a public reconciliation with Rihanna on the way? “The meeting of two personalities is like the contact of two chemical substances: if there is any reaction, both are transformed”. That is synastry to me, how you react to one another and sadly I do not see any joy between Chris Brown and Rihanna and I have to wonder how did they make it through the latest Jay Z concert they reportedly went to? infamous conjunction, but sadly the moon didn’t enter Taurus till 2 days later. Rihanna if you birth date is incorrectly published Call Me Ill fix that real quick! 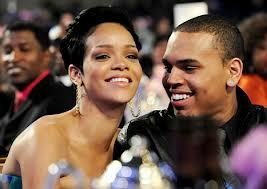 I m hard pressed to find anything in their synastry that would inspire Rihanna to label him the love of a lifetime. I want to strongly stress that synastry goes both ways I do not see any indication that she is the love of his life either. Chris Brown was born with his Sun, Moon and Venus in the sign of the earthy bull. His entire chart is made up mostly of water and earth with Mars planet of aggression placed in possessive Cancer and his outer planets Saturn, Uranus and Neptune all placed in Capricorn and Pluto in Scorpio. His Pluto naturally opposes his sun and moon indicating control and power will be themes in his personal relationships. It comes as no shock to me that Rihanna having Pluto also placed in Scorpio opposes his Sun and Moon. He will have these sort of issues always, learning to deal with them is key. Now we have Rihanna with a Sun in Pisces, a fiery moon in Aries and Venus placed in also in the impulsive Ram whereas Mars planet of aggression is placed in fire sign Sagittarius. As I combed through their synastry I m having a difficult time seeing where the love is? In a hopeless place indeed. They have major oppositions, like mini landmines all over their synastry. Oppositions in astrology represent opposing forces hence the term oppositions. With the right planets in opposition their certainly is an air of attraction, but it takes A LOT of give and take to work through the rough patches. 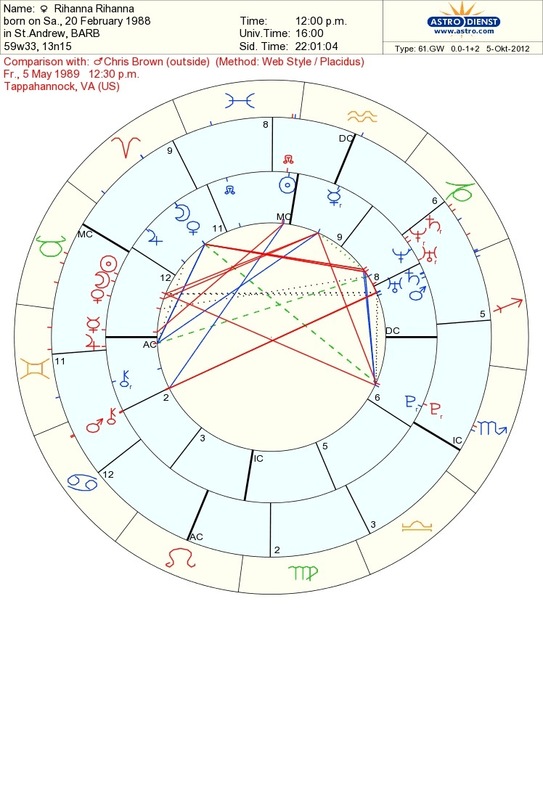 With Chris Brown and his 3 planet sin Taurus we know he can be infamously stubborn and Rihanna and her 4 planets placed in fire signs she is impulsive. This does not make for a good combination. The sun is the identity. Pluto is an agent of change opposing the sun a contrast is generated between light (the sun) and dark (Pluto). I have touched on these themes in many of my blog posts. This adds an element of wanting to have that person and having no idea why?! The Sun person may feel like the Pluto person is attempting to change them and quite plausibly they are. Pluto wants to bring you to your highest self at all costs while the Sun may be content shining as is. I will tell you a true story, I said to my astrology instructor once I love Pluto on the moon in synastry it represents emotional depth, and it is so intense. My instructor was horrified he said something to the effect “Pluto transforms whatever it touches. It wants to dig in, cut deep, rip your heart out and ask “now how do you feel” The moon is a soft place, its lights; it’s the tender part of the person. Perhaps Chris Browns moon in Taurus wants to eat bon bons and run a bubble bath, but Rihanna comes along and it is intense! Emotional obsessions. This synastry aspect comes equipped with manipulation, and controlling tendencies. And a big fat warning label: Good luck being just friends. Their Mars planet of aggressions labeled the God of War are opposing one another. 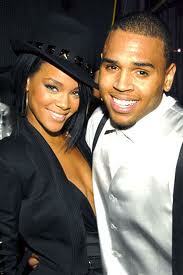 His in Cancer and Rihannas in the late degrees of Sagittarius. I don’t think I have to elaborate this is aggression, I want to win, I will show you, it’s going to be my way…the ultimate tug of war. Chris Browns Mars in Cancer also opposes Rihannas Saturn, Uranus and Neptune. I will note that Chris Browns North Node Conjunct Rihannas Sun indicating Rihanna offers a learning experience for Chris Brown in this lifetime, this aspect is also indicative of strong Karmic Ties. Can you do one of Rihanna and Drake? There relationship has always fascinated me. They’re Pisces and Scorpio, but I’d be so interested in delving deeper and finding out more. They’ve had these 2 month flings/situationships every year since 2009. And I’d like to know what it is that keeps them going back to each other.